The redevelopment of the HVB-Tower was a particular challenge, as the building is a Munich landmark. The HVB-Tower is a one-of-a-kind building with a fascinating design and appearance. The apparent 'dematerialization' of the building designed into the façade by the architects Betz makes it unique. The HVB-Tower is a formative feature in the Munich skyline. Since its inauguration in 1981, the Tower has undergone a number of transformations, the largest being the conversion of the retail centre in the north low-rise building (1998-2000). The renovation of the casino and the south low-rise building in 2001 was the last major action before the building was listed in 2006 –even though its interior, unlike the external façade, was no longer in the original condition. Because of the earlier conversions, hardly any material from the original structure were still in place. This freedom was used to do justice to the high artistic standards of the building with a subtle interior design based on the building shell and its design principles. The renovation would have to retain all of the façade’s design and visual characteristics and reconcile them with modern technical requirements. From the moment that HVB Immobilien AG awarded the contract, HENN and the client entered into an intensive dialogue with the conservation authorities and with Oliver Betz, the son of the original architects. Only in such dialogue was it possible to develop a façade concept that guaranteed the functional and physical construction requirements of a modern skyscraper exterior while keeping its appearance identical with the original façade. To give a more than thirty-year-old building new, energy-efficient technology and a modern office concept and to refurbish the façade without changing the external appearance was a challenge. To achieve a similar silvery reflection as that of the original façade, for instance, some 20 panes from various glass manufacturers were compared over many months, as the new façade was not to differ in any way from the design of the architects Walther and Bea Betz, who wanted it to reflect the sky. The façade changes and continues to change during the course of each day, with the passing of the seasons, and the weather. In the endeavour to have the existing building certified as a ‘green building’, the dismantled façade elements were sorted and separated. While most of the non-reusable parts were recycled, the aluminium outer shells of the balustrade panels were cleaned and reused. The perforation of the façade elements was integrated in such a way as to render it invisible. Improving the energy efficiency of the systems engineering allowed for the implementation of an up-to-date, user-friendly climate-control concept in the ostensibly unchanged shell. The renovation of the original single-shell façade was a prerequisite for creating a modern climate-control concept. The idea was to enable the entry of fresh air by means of openable tilt windows. In coordination with the heritage authorities and technical teams, single- and double-shell façade variants were analysed with regard to their use of daylight, sun protection, natural ventilation, and smoke extraction. Other factors considered were the thermal building physics, weather protection, fall protection, fire protection, sound insulation and building acoustics. The simulations were reviewed in original size on façade mock-ups. The elements were subjected to leak and weathering inspections on test rigs. The investigation concluded with a feasibility study on recycling the existing façade, the building costs, and the recyclability of the new façade in accordance with the LEED (Leadership in Energy and Environmental Design) standard, with the aim of having the building classified in accordance with the LEED system. In addition to environmental and economic aspects, the social and technical quality as well as the process and site quality were examined. A double shell façade element as a box window construction was the most convincing design. Its inner shell consists of an acoustically effective balustrade panel and an electromotive tilt opening vent with double glazing. This technology allows users to tilt and close individual interior opening vent by pressing a button. Alternatively, the windows are opened and closed by means of a central control panel. The outer shell of the façade differs from its predecessor only through a barely perceptible perforation in the supporting structure. The reflection of the sky, which the original architects achieved with a layer of gold/silver vaporised onto the sunscreen-insulating glass panes is now achieved by a sun-protection coating of the non-insulating fixed glazing of the outer shell. Its glass panes are connected into a laminated safety glass pane using EVA film. The heat transfer coefficient was optimised by the excellent insulating properties of the new façade design. This included all glass panes throughout the building being triple-glazed. The new glazing has also improved light transmission . The sophisticated ventilation system of the new façade allows natural fresh air to enter despite the closed appearance of the outer shell. Previously, the in- and outflow of air was controlled solely by an air-conditioning system whose convectors along the windows were removed during the renovation. Now, perforations in the horizontal profiles and imperceptible holes in the lateral joints of the façade elements allow fresh air to be fed into the box window cavity. In its dual function, the ventilation system also protects against the overheating of the façade cavity, whose air flows and temperatures were elaborately calculated with simulations using computational fluid dynamics . To reduce the solar heat input, the double façade is equipped with a sun screen made of aluminium Venetian blinds integrated into the box windows. The sun screen is protected by the outer impact pane and is therefore unaffected by wind load and weather effects. In addition, it serves as glare protection. Modern heating-cooling ceilings ensure a comfortable indoor climate. The opening vents enhance user convenience. The heating/cooling ceiling is supplied with energy as needed via a geothermal system. Full-surface, daylight-sensor controlled LED lighting that is also individually controllable reduces the installed load to between 9 and 10 watts per square metre. 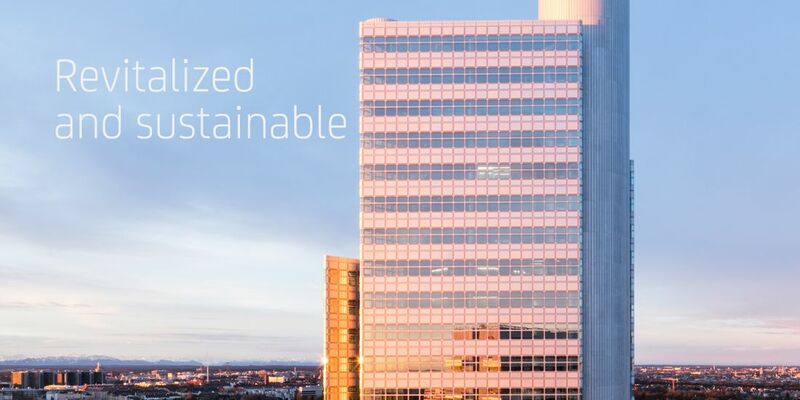 The HVB-Tower will have reduced CO2 emissions thanks to the reduced energy requirements for heating, cooling and electricity. Fire protection for the HVB-Tower was designed in accordance with the high-rise directive. The tower’s existing staircases were upgraded to pressure-vented safety stairwells. In the event of fire, fresh air would be blown into all four stairwells so that they remain free of smoke and enable a safe evacuation. The excess pressure generated by the blown-in air needs to escape through the building shell again in a controlled way. This occurs at the corners of the building through a combination of rotary blades in the inner shell and parallel opening windows in the outer shell. Safety is also ensured with a full-scale sprinkler and monitoring system by a fire detection system. By optimising the internal structure of the floors for fire protection purposes, great flexibility in office space structure was achieved. The building that the Tower rises from was given a newly designed entrance hall. A spectacular space made from unfolded polygonal surfaces of varying inclinations and angles extends over two floors. This multifaceted sculpture reminiscent of a crystal harmoniously accommodates the balustrades and floors. Through the triangular glass mono-pitch roof, daylight streams onto the matte white, angular solid surfaces, and at night is replaced by artificial light. The sightlines between the floors created by this spatial sculpture connect the food court and the cafeteria on the first floor with the event area on the second floor, and draw the eye upwards, where above the glass roof the 114-metre high HVB-Tower rises to form a distinctive feature in the Munich skyline.